Twitter is rolling out several new features this week aimed at reducing abuse and harassment, following up on changes introduced a few weeks ago. More than just making it easier to report abuse, it’s trying to make sure you don’t see it in the first place. That starts with leveraging AI. For example, if Twitter sees an account is constantly tweeting at non-followers without solicitation or is “engaging in patterns of abusive behavior,” it will make its tweets only visible to followers. In other words, trolls can still say troll-y things to their troll-tastic friends, but Twitter will try to stop providing them with a platform to reach wider audiences. In that vein, you’ll now have the option to filter out posts from accounts without a profile picture (the ones with the default “egg” photo), as well as unverified emails or phone numbers. It’s a feature that’s been requested for some time, as it’s previously been easy for trolls to leverage new or unused accounts to harass people. 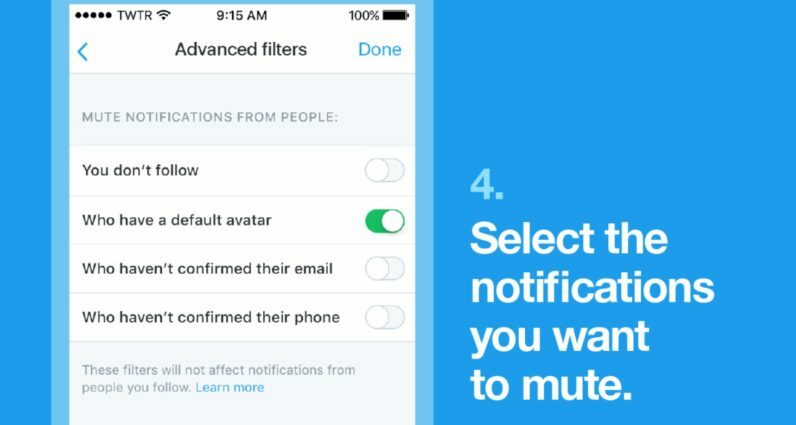 The mute feature introduced in November – which lets you block specific words and phrases from tweet notifications – has also been expanded with the option to block said tweets from showing up on your timeline as well. That should ensure you don’t have to see tweets with offensive language anywhere on the site. Lastly, Twitter will be a bit more open about the reporting process. You’ll receive a notification both when Twitter receives a report and when it takes action against a user. Previously Twitter would inform you about this via email, but having the info available in the notifications tab is a lot more convenient and readily visible. As with any algorithmic system for identifying user behavior, Twitter runs the risk of incorrectly categorizing tweets and accounts as offensive. Twitter’s public nature makes it particularly difficult to strike a balance between free speech and abuse, but by taking steps to limit the audience of potential harassers, it’s striking a better balance than it has in the past. Now Twitter needs to make sure users are properly informed these tools are available so they can minimize abuse in the first place.